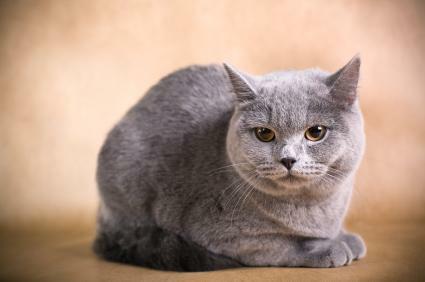 A gray British Shorthair cat. When you see your normally healthy cat throwing up, it is cause for concern. A cat may throw up for any number of reasons, some of which are to be expected and others that may require a trip to the vet. The key to knowing how to care for an animal that has just thrown up is to understand what is normal and what isn't. If your cat has been throwing up hairballs and grass, there is little cause for alarm. A cat will eat grass to help him throw up hair that has accumulated in his stomach from grooming since it isn't easily digested. It is usually easy to discern this type of vomit, since the green grass the cat has eaten is visible. If you've observed your cat throwing up and it isn't hairballs or grass, there may be a more serious reason. The following are the types of vomiting scenarios that are common in felines. Constant vomiting: The cat will vomit almost constantly, and the liquid is clear and frothy. This can be caused by ingesting grass to eliminate hairballs, since the grass can irritate the stomach lining. The cat may have already thrown up the grass earlier, but his stomach is still irritated. Another reason may be from eating spoiled food. If the vomiting doesn't stop within 24 hours and it is accompanied by diarrhea, seek medical care for the animal. Sporadic vomiting: The cat will vomit every once in a while over a period of days or weeks. It is not always associated with eating (cats that overeat may vomit soon after they have eaten). A cat that is vomiting sporadically may become listless and tired, neglect grooming and lose interest in eating. This may be a sign of intestinal parasites, liver or kidney disease, acute metritis or severe hairballs. All of these scenarios require a visit to the veterinarian for an accurate diagnosis. Vomiting blood: One of the most frightening sights for a cat owner is the appearance of blood in the pet's vomit. If the vomit resembles coffee grounds, take the animal immediately to the vet since he may have suffered internal injuries. Vomiting feces: An animal that is vomiting feces most often has suffered a serious internal injury or has feline infectious peritonitis. The animal may also have an obstruction in his digestive tract. Vomiting worms: An animal that is vomiting worms has internal parasites. This is often observed in kittens. Giving a kitten an adult dose of cat wormer will cause extreme pain in the animal. If you are unsure of the proper dosing for a kitten, take it to the vet for proper care. If you have a sick animal that may need expert care, keep him limited to one room so that you can observe him. If you have a large cage that has plenty of room for a bed and litter box, this may be the best place to keep the animal temporarily.A cat that has been vomiting frequently can become dehydrated quickly. This is especially true of kittens and older cats. Visiting a veterinarian may be required sooner than 24 hours if the animal has become limp and listless. An animal in this condition will require intravenous fluids as quickly as possible to help him survive. Animals that are vomiting frequently should have their food withheld until the vomiting subsides. If the animal has persistent vomiting, even after his food has been withheld for 12-24 hours, he should be taken to a veterinarian for examination. If you are ever in doubt as to the condition of your animal, seek medical attention. It is always better to err on the side of caution than to wait until a condition has reached an emergency stage. A quick phone call to the vet may be all that it takes to save the life of your pet.